Gwolnaegaksa is split into an east side and a west side by Geumcheon (Hangeul: 금천; Hanja: 錦川), a stream that runs down the middle of the area. I took a panorama on the bridge that crosses the stream at the northern end of Gwolnaegaksa. 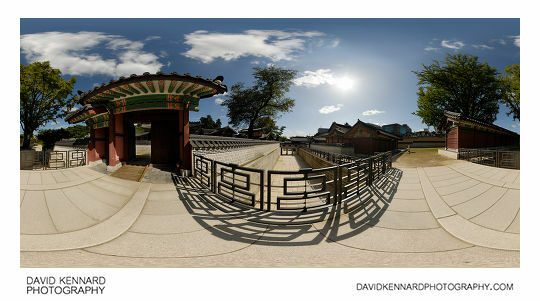 You can see the 360 version here: Changdeokgung palace – Gwolnaegaksa 360 VR. Unfortunately I forgot to take the zenith (up) shot for this panorama, so I attempted to blend in the zenith shots from two of the other panoramas I'd taken that included clouds in the sky. The result isn't perfect, but I think it's better than having only a partial panorama or a big hole in the sky. Crossing over Geumcheon you come to an area where Seonwonjeon was originally located. 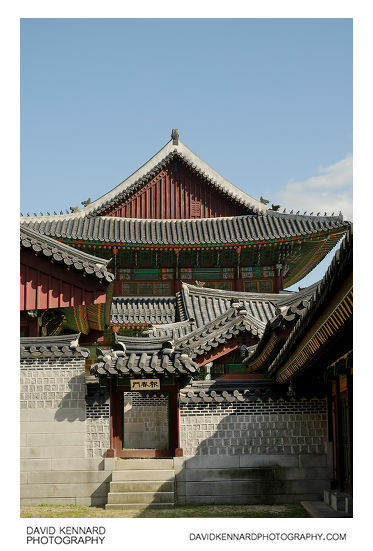 In the photo above you can see Naechaldang (Hangeul; 내찰당; Hanja: 內察堂), one of the auxiliary buildings of Seonwonjeon. 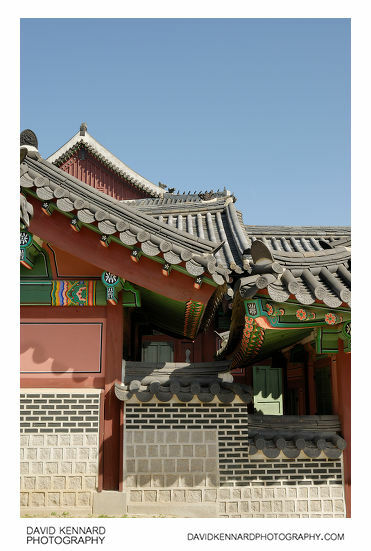 Seonwonjeon (Hangeul: 선원전; Hanja: 璿源殿) was the ancestral shrine where portraits of former kings were enshrined and ancestral rites performed. 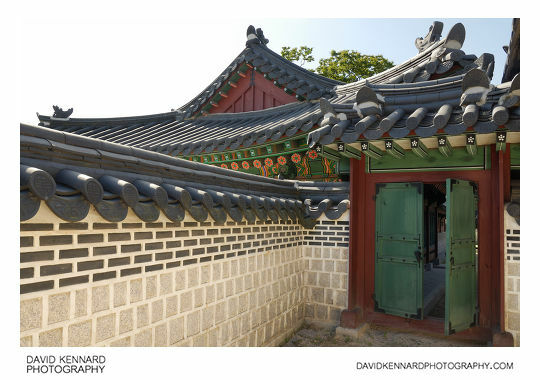 At the south-eastern corner of the Seonwonjeon area is a gate called Bochunmun (Hangeul: 보춘문; Hanja: 報春門), which leads to Yangjidang (Hangeul: 양지당; Hanja: 養志堂), where the king stayed the night before the ancestral ceremony. Looking up at the roof of Seonwonjeon you can see the bright colourful painted roof eaves. 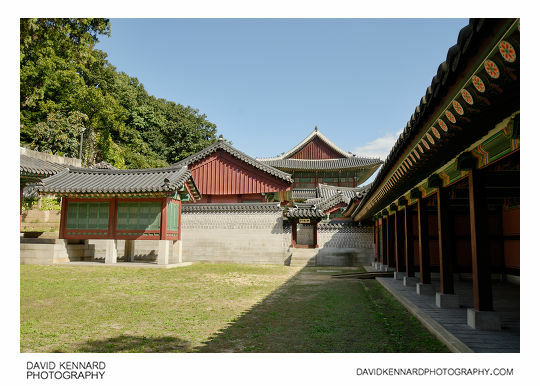 Seonwonjeon also has two smaller auxiliary buildings connected to the back of it. I took a photo looking down the gap between Seonwonjeon and these buildings. 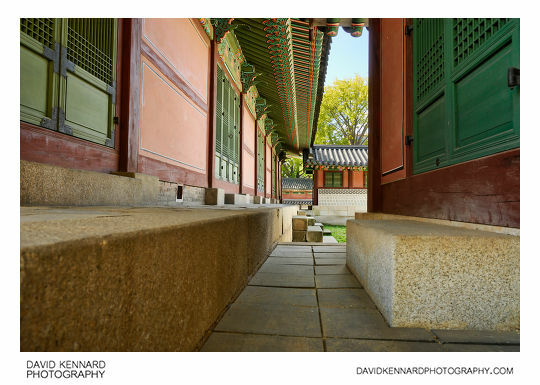 During the Japanese occupation New Seonwonjeon was built further north in the rear garden of Changdeokgung, and the area here fell into disrepair, with all the auxiliary buildings being removed. The area was restored to its original state in 2005. 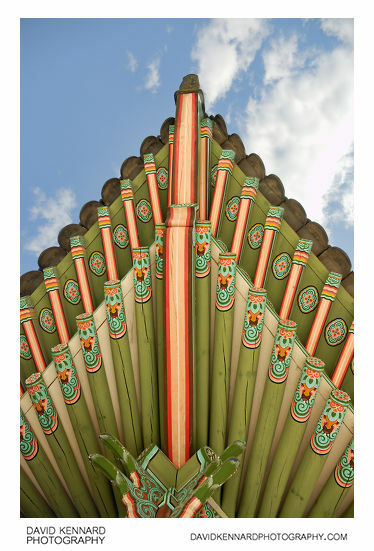 Above is a small gate in the eastern side of Gwolnaegaksa. And some more roofs and walls.